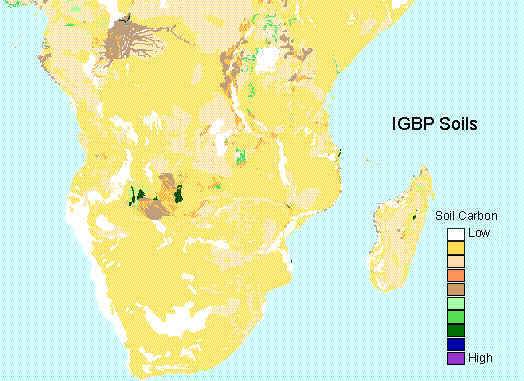 The data set consists of a southern African subset of the "Global Gridded Surfaces of Selected Soil Characteristics (IGBP-DIS)" produced by the International Geosphere-Biosphere Programme - Data and Information Services. Data files are provided in ASCII GRID format. The "Global Gridded Surfaces of Selected Soil Characteristics (IGBP-DIS)" data set contains seven data surfaces: soil-carbon density, total nitrogen density, field capacity, wilting point, profile available water capacity, thermal capacity, and bulk density. All the surfaces are global, at a resolution of 5 x 5 arc-minutes, in ASCII GRID format for ARC INFO. Each file contains a single ASCII array in a geographic (lat/long) projection. The ASCII files consist of header information containing a set of keywords, followed by cell values in row-major order. These data surfaces were generated by the SoilData System, which was developed by the Global Soil Data Task of the IGBP-DIS. The SoilData System generates soil information and maps for geographic regions at soil depths and resolutions selected by the user. Derived surfaces of selected soil characteristics are suitable for modeling and inventory purposes. The data surfaces are also distributed as part of the Global Soil Data Products CD-ROM. The SoilData System uses a statistical bootstrapping approach to link the pedon records in the Global Pedon Database to the FAO/UNESCO Digital Soil Map of the World. It can generate maps and output data sets for a range of original and derived soil parameters, such as carbon and nitrogen density, thermal conductivity, and water-holding capacity, for any part of the world at user-selected depth ranges. The digital output can be at any resolution (in increments of 5 minutes). Image of soil-carbon density (kg/m2) at a depth interval of 0-100cm (legend at right). See this data set companion file for additional SAFARI 2000 subset images. Global Soil Data Task. 2002. SAFARI 2000 Selected Soil Characteristics, 10-km Grid (IGBP-DIS). [SAFARI 2000 Selected Soil Characteristics, 10-km Grid (International Geosphere-Biosphere Programme - Data and Information Services)]. Data set. Available on-line [http://daac.ornl.gov] from Oak Ridge National Laboratory Distributed Active Archive Center, Oak Ridge, Tennessee, U.S.A. doi:10.3334/ORNLDAAC/647. Carter, A. J., and R. J. Scholes. 2000. SoilData v2.0: Generating a Global Database of Soil Properties. CSIR Environmentek, Pretoria, South Africa. Food and Agriculture Organization of the United Nations (FAO). 1995. The Digital Soil Map of the World, Version 3.5. FAO, Rome, Italy. Global Soil Data Task. 2000. Global Gridded Surfaces of Selected Soil Characteristics (IGBP-DIS). International Geosphere-Biosphere Programme - Data and Information Services. Available on-line [http://www.daac.ornl.gov /] from Oak Ridge National Laboratory Distributed Active Archive Center, Oak Ridge, Tennessee, U.S.A.
Scholes, R. J., D. Skole, and J. S. Ingram (eds.). 1995. A Global Database of Soil Properties: Proposal for Implementation. Report of the Global Soils Task Group, International Geosphere-Biosphere Programme - Data and Information Services (IGBP-DIS). IGBP-DIS Working Paper No. 10, University of Paris, Paris, France. For information on preparation of this subset, parameter/variable names, variable description/definition, units of measurement, and data file format see this companion file http://daac.ornl.gov/daacdata/safari2k/soils/IGBP-DIS_Soil_Surfaces/comp/S2K-IGBP-DIS_readme.pdf.